To switch the ‘current’ debug context I use the ‘Debug’ view and select the ‘thread’ I want to debug: then all the other views follow that thread context. For eclipse it does not matter if they are ‘threads’ like in an RTOS environment, separate cores on a multicore SoC or multiple boards: it is all the same. Multiple board debugging is easily possible if I’m using two different debug (hardware) connections, e.g. one P&E Multilink Universal and one Segger J-Link. 💡 It does not matter if it is a ‘real’ Segger J-Link or P&E Universal Multilink: the same applies for the ‘OpenSDA‘ version of both. With using GDB I need to understand a bit the inner working so I can play with multiple GDB debug sessions. In this post I show how to debug multiple boards with the same GDB server, but for multiple boards. 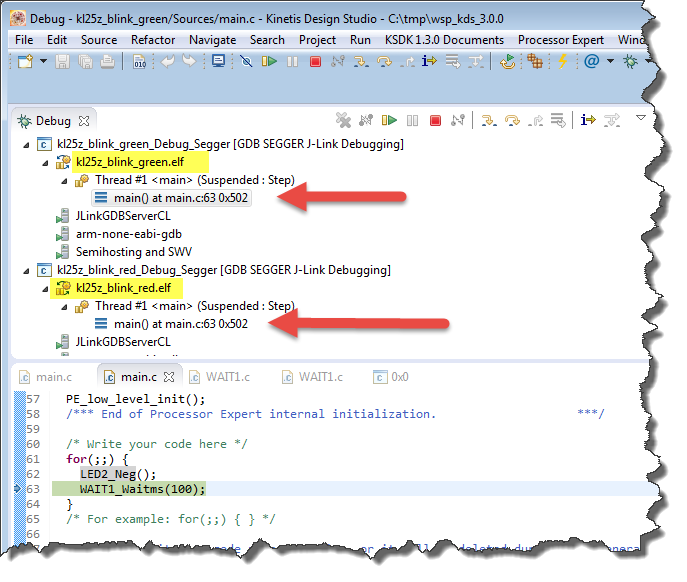 I’m using the NXP Kinetis Design Studio (Eclipse based IDE), but the same principles apply both for command line GDB debugging or using any other Eclipse based IDE as long as they are using the GNU Debugger (GDB). Starts GDB Server listening on a specified port. This option overrides the default listening port of the GDB Server. The default port is 2331. In the GNU ARM Eclipse debugger panel for Segger J-Link I can specify the port number. If I start the debugger, I get a dialog from Segger where I can choose the emulator I want to use. 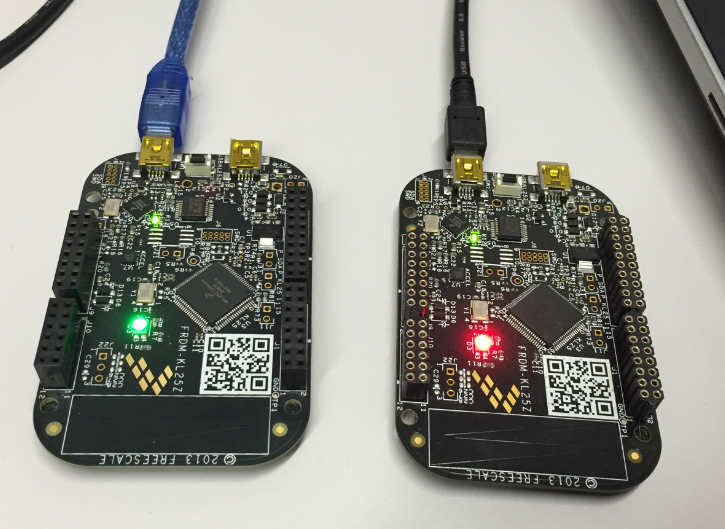 In the case of two NXP Freedom Boards with Segger OpenSDA firmware, they are both identical and show the same serial number (SN). So I have to guess and pick the correct one. If using a ‘real’ Segger J-Link it would show the serial number which is on the back of the J-Link probe. For the above case with identical serial numbers it seems that the ‘#’ corresponds to the physical USB port. At least with my experiments the number stays with the USB port and is not depending on the order how the boards are plugged. That might be different for other host systems. 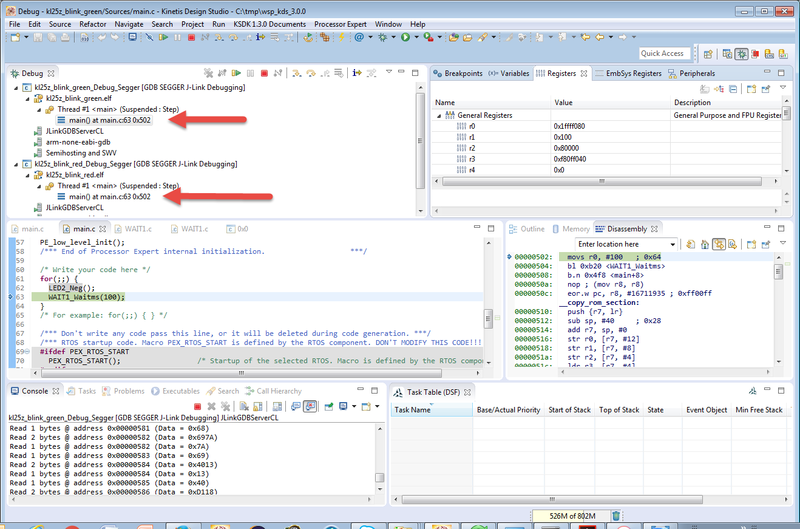 It is possible to debug multiple microcontroller and boards the same time with a GDB based IDE like the NXP/Freescale Kinetis Design Studio. 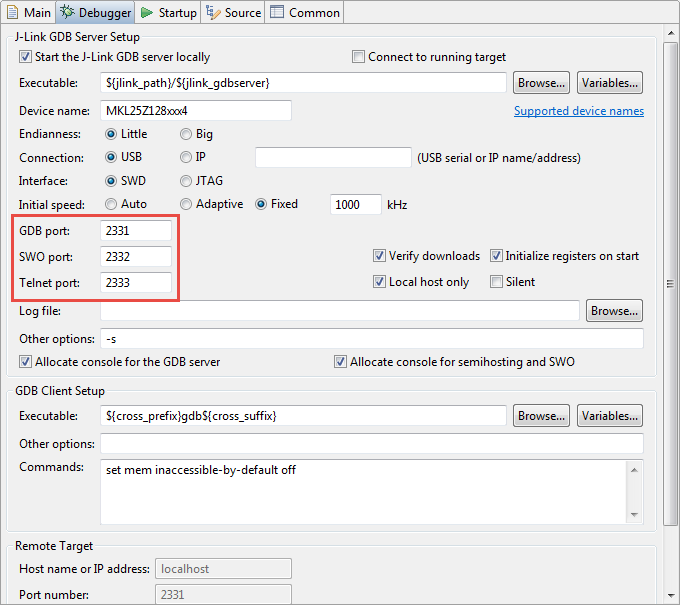 Because there is a TCP/IP connection with ports from the GDB client to the server, it is required to specify different ports for the board. Then it is up the GDB server to select the USB connection. 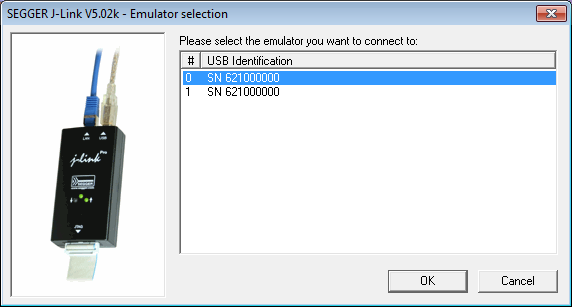 In the case of the NXP OpenSDA implementation multiple boards might report the same USB SN (serial number), so it takes some guessing at this stage. But then I can debug multiple boards the same time from Eclipse. This entry was posted in ARM, Boards, CPU's, Debugging, Eclipse, Embedded, Freescale, KDS, NXP, Tips & Tricks and tagged Debugging, Eclipse, freedom board, Freescale, KL25Z Freedom Board, KL46Z Freedom Board, OpenSDA, Segger, technology, Tips&Tricks by Erich Styger. Bookmark the permalink.